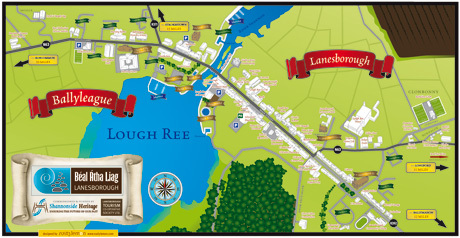 Welcome to the Lough Ree Community Resources website which represents the villages of Lanesborough and Ballyleague at the very top of this beautiful lake and Newtowncashel, nestled near the Eastern shoulder of the lake, not forgetting the lovely places in between. This website is produced by the Lough Ree Community Resources in association with the local business forum. The purpose of the website is to showcase what the area has to offer visitors and locals and promote local business. We have a calendar of events for the year, with details of each event; history and heritage information; a directory of local businesses, including accommodation; and a directory of clubs and societies, not to mention weekly updates for local notes. Please feel free to contact us with notes and news, or your details if you are a local business or club. Lanesborough is located on the eastern banks of the River Shannon at the northern end of Lough Ree. Approximately 10 miles southwest of Longford town, Lanesborough is divided in two by the River Shannon and marks the northern entrance to Lough Ree. The portion of the town on the western side of the River lies in County Roscommon and retains the old Irish name for the settlement of Ballyleague (‘Beal Atha Liag’, meaning Ford of the Stone). Read more about Lanesborough/Ballyleague heritage. The town is located in the parish of Rathcline, which has 36 townlands. The town was primarily a market town to serve the local farming community and during the 1950s experienced considerable growth with the development of a peat-fired ESB generating station and the development of Bord na Mona’s peat production facilities. During the 1970s the area earned world recognition as major coarse angling location, spawning a local tourism industry. Newtowncashel is a picturesque town situated on the North Eastern Shore of Lough Ree and Tidy Towns winner. It has fertile farmland surrounded by bogland to the North and East. This small farming town continues to charm visitors throughout the year and is the home of world-renowned sculptor Michael Casey. Newtowncashel or ‘Cor na Dumhca’ in Irish, is an ancient name meaning Round Hill of the Cauldron. Two important historical sites in the Newtowncashel area are ‘Inis Clothrann’ or Inchcleraun, also known as Quakers Island where St. Diarmuid founded an abbey in the year 540AD and Saints’ Island where St. Kevin founded a monastery in 544AD. The ruins of the old parish church, St. Catherine’s and the burial grounds are on the side of Cashel Hill overlooking Lough Ree. Read more about Newtowncashel’s heritage.